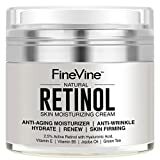 FineVine Retinol Moisturizer Cream for Face and Eye Area – Made in USA – with Hyaluronic Acid, Vitamin E – Best Day and Night Anti Aging Formula to Reduce Wrinkles, Fine Lines & Even Skin Tone. FineVine Retinol Moisturiser cream MOISTURIZES & HYDRATES THIRSTY SKIN: Do not let your pretty face and skin dehydrate anymore. Keep it plump and supple with the ultimate active Retinol face moisturizer. Boost hydration levels, speed cell turnover , restore lost elasticity and ensure long lasting moisturizing all day long. Ideal for your face, eyes, neck and décolletage. DELUXE SKINCARE FORMULA WITH ACTIVE RETINOL: Made of high quality ingredients and extracts. FineVine Organics facial moisturizer cream is 100 % safe for all! It contains Retinol, Hyaluronic Acid, Vitamin E and B5, Jojoba Oils , and Green Tea Extracts. Worry no more about breakouts , redness and itchiness! We’ve got you covered. HIGHLY ABSORBENT – HIGHLY POTENT: Toss away all those runny creams. Forget about skin greasiness. Get yourself the finest Retinol moisturizer treatment today and enjoy the most intensive skin care at home. Its highly absorbent ingredients deeply penetrate your skin, leaving it luminous, supple, firm, revitalized, perky, and soft. Touch it and see for yourself . Get That Silky Soft & Glorious Skin Back! With FineVine Organics Retinol Moisturizer Cream! … cheaply made creams that always let you down. … dark spots and pores. Say YES to your best face ever with a FineVine Retinol moisturizer cream! Welcome the glorious skin era! Are you ready for this? All you need to do is invest in a luxurious FineVine Organics Retinol moisturizer and let it do the rest. Cherish the most astounding anti aging benefits of Retinol, (Vitamin A) in the comfort of your bedroom. 5 Steps Away From The Most Luminous, Youthful & Radiant Skin Ever! 1. Get a FineVine Organics Retinol moisturizing cream. 2. Wash your face with lukewarm water and gently dry! 3. Open the jar, take some cream and dab onto your skin. 4. Spread upwards and outwards. Use a swirling motion to blend the cream into your skin. 5. You are all set.